No extra meaning. This just makes me laugh. Periodically I start writing one of these posts and I’m astonished that five years have passed. Not because things have changed, but because I can clearly remember writing the posts. I didn’t write MMMM #6 but I remember putting the post together. I remember thinking, “Damn, I wish the background was whiter. It would really make the figures pop.” Terry mentioned a $880 price tag for a Purple #153, but I can’t find it on the site. Very frustrating. The AW #135 had a Purple #153 that sold for $599.99. The post also had a loose prediction that was 100% correct. The prediction was the eBay would be clogged up with more and more outrageous auctions. 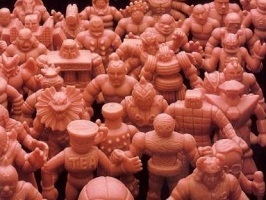 Unfortunately it doesn’t look like M.U.S.C.L.E. sellers followed Mollusk’s example.I remember feeling so frustrated and the Nicholson gif felt like a perfect expression of my feeling. I was so happy with myself that smug is the only appropriate description. AW #135 also has a problem that I can’t clearly remember the genesis or solution. For some reason uploading jpegs was occasionally a problem. The easy solution was imageshack. Unfortunately, five years later those pictures are gone. Even more strange, I have old AW #134 and AW #136 pictures. Weird. I went from 15 figures to 12 figures in about a year. That’s not too bad. Five years later there are 8 figures still needed. Four figures over five years doesn’t sound as impressive. The silver lining is that, using that same pace, the set should be done before my 50th birthday party. Finally, I remember the hand. I thought it was a far too clever bookend to MMMM #6. I have to admit there was an awful lot of smugness after most of these posts. Looking back, it wasn’t that clever. This entry was posted on Saturday, June 9th, 2018 and is filed under UofM News. You can follow any responses to this entry through RSS 2.0. You can skip to the end and leave a response. Pinging is currently not allowed.